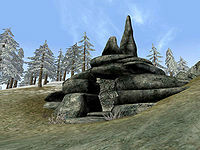 Connorflenge Barrow is a small burial ground east of Uncle Sweetshare's Workshop, along the coast. The barrow contains two dead adventurers and a skeletal corpse along with other bones. You can find one piece of raw stalhrim here. There are four type 1 barrow chests (all with level 50 locks) and two type 2 barrow chests (one with a level 70 lock and one with a level 80 lock). The barrow itself has a level 95 trapped lock on its door. There is an 80% chance of encountering the cave's only inhabitant: a Confused Lunatic during the day or werewolf at night. This page was last modified on 13 April 2013, at 21:37.